It’s Summer–Time to Plan Your Trip! Any time you can get a mile by mile guide for a place you are visiting, go for it. I love this book! Summer will be here before you know it. Are you ready? You know what that means: kids out of school, time to play, and vacation! I already have several things planned for this year. You too? Even though I live on the Oregon Coast, there is so much I haven’t seen. Last summer I got started though, when I went on my first girls road trip, with two good friends. Best trip ever! We met in Portland, spent a few days there, then cruised down the famous Highway 101. It seemed like we would have plenty of time, but we didn’t get to see half of what there is to see. We relied on a photographer’s guide book and a mile by mile guide to help us along. Usually I buy ebooks these days, but honestly for a tour book, it’s nice to have a paper version. It’s so easy to thumb back and forth through the pages of the area you want, to mark or highlight what you want to see. Next time I will even make notes in mine, to make it easier to remember! It was such a help it was to know we hadn’t missed what was next on the trip, all the way down the 101. We already are planning our second annual girl’s trip. I can’t wait! I hope you make this trip if you get a chance. You won’t be disappointed. And be sure to bring a book like this one. An ideal book for the coastal drive. With so much to see, you want to be sure to hit your favorites. Whether a hike, a trip up the river, a local museum, this book will direct you. The towns can be grouped close together, so it can be hard to catch all the little turns. Yet to miss some of them, you might miss some of the most beautiful sights Oregon has to offer. I highly recommend this book for your trip. It’s a great resource for planning a trip too. A book like this is invaluable when you are on a driving trip. Along this gorgeous coast, there are little towns every hour or so. And in between each are so many different attractions you may not want to miss. And cruising the gently winding roads, it’s pretty easy to miss a sign or a turn. With this handy guide, you know what comes next. It makes planning your route each day so much easier. That way you can be certain you don’t miss anything you really want to see. Some might be interested in the golfing, some in shopping, but I bet more are looking to see some of the incredible rocks, like Haystack or Face Rock. There are plenty of lighthouses, bridges, and state parks. Plenty of rivers meet the sea throughout the length of the coast. Waterfalls are abundant, some requiring a hike on one of the many trails. Interested in history? Stop in the museums and visitor centers along the way. The beaches are wonderful, with tide pools, seals, and birds–even puffins. And don’t forget the wineries and restaurants! 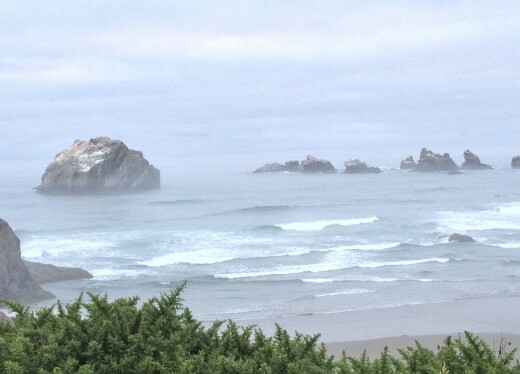 If you are planning a visit to Oregon, you won’t want to miss the Oregon Coast. Bandon by the Sea may be the most beautiful beach you will visit here. A photographer’s paradise everyone will enjoy. Brookings, on the Southern Oregon Just above the California, you will find the little town of Brookings/Harbor. A lovely fishing harbor, quaint shops, beautiful beaches and campgrounds. Popular year round. A guide book–in actual paper–is helpful if you are unfamiliar with a state. We found for the coast, the photographer’s book, which went sight by sight, and our mile by mile guided suited our trip perfectly. If you can’t get a mile by mile guide, this book would be my second choice. The author/photographer goes along the coast, advising best cities and stops for incredible photos. If you have just a few minutes to spare, you might enjoy this brief video that shows you some of the beauty to be found along the coast. I do love the Oregon Coast. I remember the first trip we took to Oregon we took the scenic route from Roseburg to the coast and it was very beautiful. i agree that for travel, paper guides are best.